Study Tips Sensory Systems 1. Now you are starting with the intense core of Medical Neuroscience, Units 3 and 4. First of all it is a good idea to start a thread in the forum to form a study group and share your experiences. You can be in touch with fellow students. that can help when the going gets tough. In addition to forum study groups you can also join the Medical Neuroscience Facebook group. That page was started in 2013 when Medical Neuroscience ran for the first time.It is open to this class as well. That 1st year people were sharing their drawing efforts for the assessments. It was inspiring and great fun, there were real artist among us (see photos on Facebook page). Study Tips Sensory Systems 2. You can use the resources on the page Virtual Lab, Unit 2: Senory Systems. Study Tips Sensory Systems 3. Study Tips Sensory Systems 4. Iva Aleksova (former Teaching Assistant) has made the table available in Google Documents. You can follow the link and you can download it in Word so you can manipulate it to suit your requirements. Here are some suggestions to use it for effective learning. You can supplement the table with images. Prints from Sylvius with printscreen (if you change preference, for example both for selected and unselected structures at 0.05 you can easily locate structures in the print). Or use the brainstem cards our mentor B.C. Jackson has made to visualize parts of pathways. You can create comparable tables when you make overviews of pain pathways. Study Tips Sensory Systems 5. For the visual system and auditory system this table cannot be used directly. Learners can try to adapt the table and write relevant information in a systematic, compact way. The product of this exercise may not be a beautiful table but instead an effective way to learn the key elements of these pathways. For central visual pathways it may be an idea to have 8 rows with quadrants of the visual fields (left superior temporal field, left superior nasal field, left inferior temporal field, left inferior nasal field, right……, etc). A row with information about the place in the optic radiation could be included for instance, maybe another about the place in the visual cortex.. The pupillary light reflex poses a challenge. Can you make a table for that? What are key elements in that pathway? And can you make a table for the auditory and vestibular system? Study Tips Sensory Systems 6. In the course B.C. Jackson has created a resource with free images of structures important in pathways (called brainstem tract images). You are free to download those images and use them for your study . Which part of the thalamus is part of the pathway? Where is the primary cortical area? Which important white matter components can be found in the pathway? Study Tips Sensory Systems 7. Study Tips Sensory Systems 8. 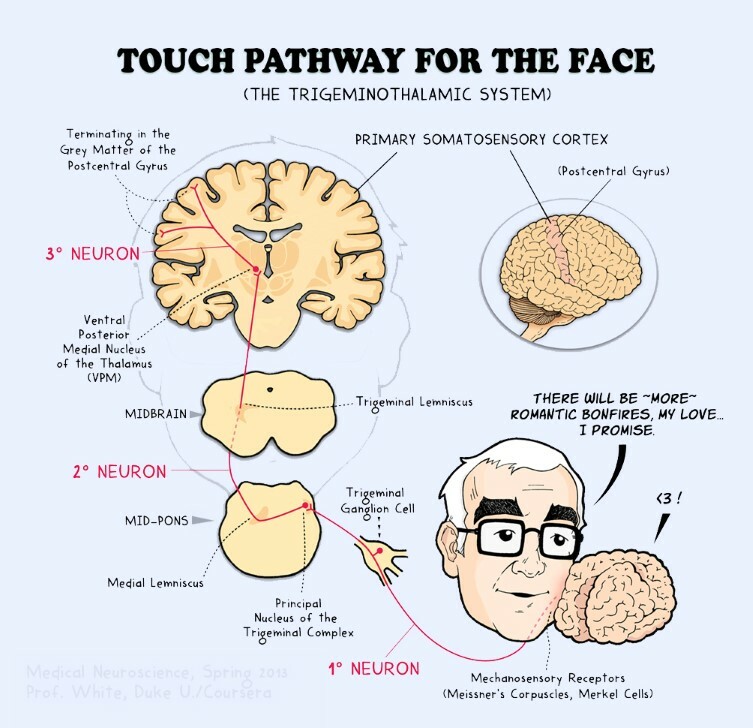 There is a place in the brainstem where damage can lead to dissociated sensory loss in sensations to the face. In medical neuroscience it is important to be able to attribute this dissociated sensory loss to the structures in the medulla. It could be very useful to re-watch Week 5, Somatic sensation, Tutorial Pain and Temperature Pathways, part 2 from 15.30 to the end of the tutorial. Study Tips Sensory Systems 9. Use the cards provided by B.C. Jackson to revise the anatomy of the parts of the brainstem and spinal cord. Use them to draw the relevant structures of the pathways. Start drawing and reviewing other brainstem structures like cranial nuclei as well, which will prove very useful when reviewing for the exams. Study Tips Sensory Systems 10. Most relevant figures from the second edition of the course textbook for sensory and motor systems are below. You can copy the name of the figure and paste it in ‘Search in this book’.Then a list of relevant pages will appear. Click ‘Show details’ of the most relevant page and a link to the most relevant page appears, click that and scroll down to locate the figure. You can only use these images for your own study, images can’t be shared. Copyright:. D. Purves et al. 2001, Sinauer Associates, Inc. For more information, see the Bookshelf Copyright Notice. Study Tips Sensory Systems 11. I like the “Handwritten Tutorials” spinal series on YouTube.